Perfect for a light summer side salad, this Quinoa Cucumber Tomato Salad is not only incredibly easy to make, it’s super tasty! I love the slight crunch of the quinoa along with the fresh, crisp vegetables. And the simple lemon dressing pulls it all together wonderfully. This salad is a great way for me to get my kids to eat some vegetables and healthy whole grains – they love this dish. And any leftovers go great in their lunch boxes the next day. If you have a few Smart Points to spare, I suggest adding in some feta or goat cheese crumbles for an added kick of flavor. It’s sooooooo good! You could also top it with some grilled chicken, and/or add in some extra roasted veggies like bell peppers and zucchini, to make to a complete meal. This Quinoa Cucumber Tomato Salad works great at BBQ’s, potlucks, parties…you name it. It’s versatile, delicious, healthy, and just 5 Smart Points per serving. This easy summer salad makes a perfect side dish to any meal. 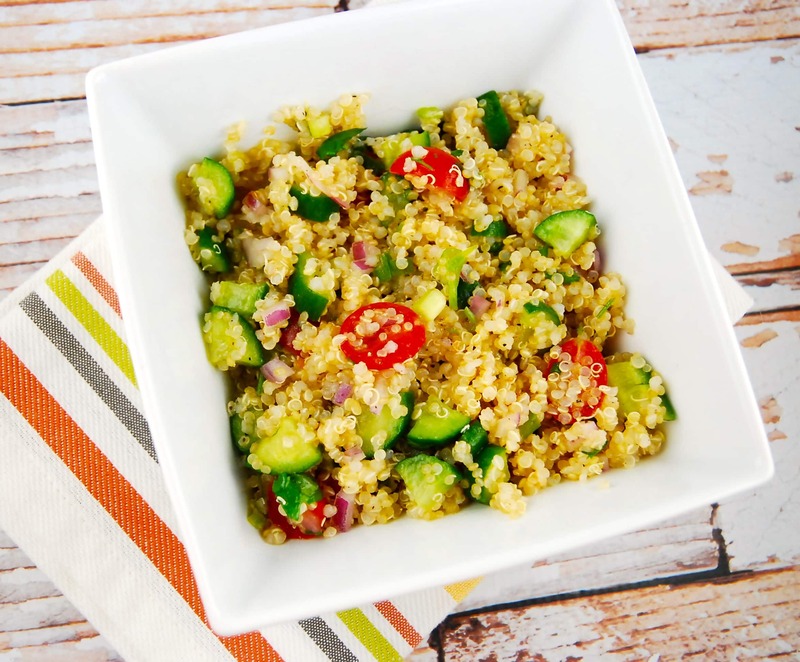 The quinoa has a slight nutty taste and crunch, and is combined with fresh cucumbers and tomato salad, making a lovely side salad that is as satisfying as it is delicious. Cook quinoa according to package instructions. Set aside until it cools to room temperature. Add remaining ingredients to quinoa, and toss well to combine.